Part I: Using observation to identify problems – or opportunities for innovation. The systematic practice of observation in order to understand people and cultures is called ethnography. identify problem areas you could address in CGT 256.
zoom in on specific issues and problems that need fixing as you work on the final project. 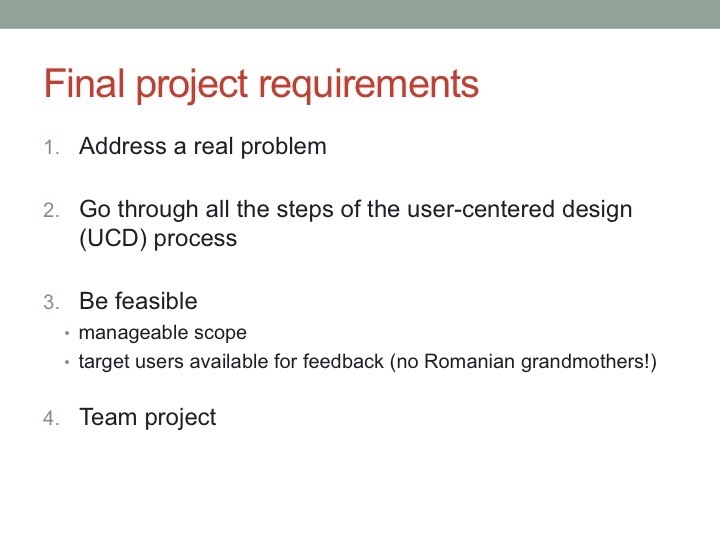 Part II: Final project requirements. I presented the requirements for the final project and we spent some time discussing working in teams. As you work with people, not everything will happen as you expect. There will be frustrations, misunderstandings, and disappointments. These are normal and nothing to fear. You just need to be prepared to deal with them. Please practice courage and maturity and, should issues arise, address them. Address them with kindness and compassion, but don’t put up with them and suffer in silence. Remember to be nice not only to others, but also to yourself! During the following week, please keep an eye out for problems that we could address with the final project.